A natural choice, their short voyage into the works of others starts with a tune by the kings of lo-fi, Guided By Voices. It would have been easy for them to take ‘Awful Bliss’ (originally from GBV’s much-loved ‘Bee Thousand’) and play it straight…but the duo choose to strip the jangly acoustic back even farther, Wayne Memmer replacing Tobin Sprout’s naturalistic vocal with an almost spoken delivery complete with a New York sneer. The end result makes the bulk of this 1:40 sound like a post-modern jibe at The Velvet Underground, before Rachel Asher’s counter vocal of the title line makes the climax veer into almost sixties pop territory. For the devoted GBV fan, this could provide an interesting listen. Far less interesting is their version of Joanna Newsom’s ‘Bridges and Balloons’. The briefly popular Newsom was particularly irritating with her fake child-like squawk and, sadly, Memmer’s cracked, slacker mumbling isn’t necessarily any better. The tune is saved by some lovely finger-picked guitar during the second half, blending with with a few tinkling sounds and plenty of cello, but probably won’t be considered essential listening for many. Tackling The Cure’s quirky 1985 hit ‘Close To Me’, the band go all out to disturb. The cellos drone in a fashion that’s rarely tuneful, yet their ugly squalls of noise somehow bring the band’s empty and sinister vision of Robert Smith’s quirky pop to life. The strings aren’t particularly any more palatable, occasionally chiming in with a squeak and scrape, while the lead vocals are even more jarring – a falsetto croon that sounds like a particularly bad Neil Young impersonation…a voice Vacation deemed unfit for Young’s own composition! The only thing that actually makes this really work is the use of pizzicato strings reworking the high end piano tinkle of The Cure’s original recording. There’s a fine line between “brilliantly imaginative” and “wilfully ugly” and this New York duo cross it with sheer glee. Echoing, empty and drenched in gurgling vocal treatments, Lana Del Rey’s ‘Blue Jeans’ becomes a lo-fi haunt-fest, though the appearance of occasional keyboard noises (in the manner of a sonar) are almost pivotal in making this cover stand out. By the time the duo decide to sing the last couple of verses in harmony, the arrangement begins to really stand up – the dual vocal and simplistic cello ensure their DIY approach sounds as full as such a musical technique possibly ever could. Finally, rivalling the Guided By Voices track for this EPs best cover, Asher – performing solo with acoustic guitar – takes Pavement’s ‘We Dance’ and reworks it in the image of many a female alt-folk performer; the downbeat, slightly glum outcome is perhaps closest to the work of Megan Hickey and The Last Town Chorus. 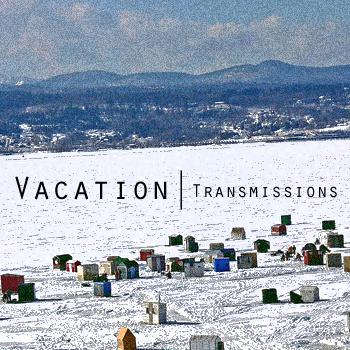 Despite Vacation’s deliberate discordance and squawky approach to many things, this bizarrely winds up sounding less slack than Pavement’s deliberate slacker-cool – and in turn, this track alone almost certainly makes ‘Transmissions’ worth a listen. As they say, if you’re gonna cover something, you may as well make the effort to make it in your own vision. A couple of these treatments (the drastic reinvention of The Cure, especially) follow that rule. Not everything works, but when it does, there’s twisted enjoyment to be had…particularly for the keener Pavement and Guided By Voices fan. [In 2013, Vacation renamed themselves No Valley]. This entry was posted in Album & EP Reviews and tagged covers album, guided by voices, indie, joanna newsom, lana del rey, lo-fi, neil young, pavement, stephen malkmus, stream, the cure, underground, vacation by Real Gone. Bookmark the permalink.